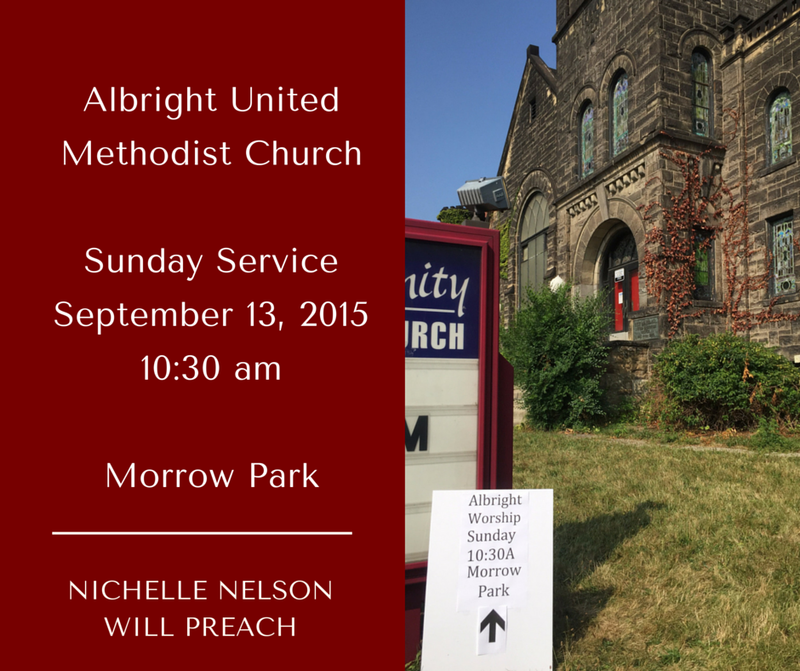 Albright United Methodist Church will again host their weekly service in Morrow Park. On Sunday, September 13, the Rev. Nichelle Nelson will be giving the sermon. Morrow Park – located 1 block from the church at the corner of S. Aiken, Centre & Baum. There is plenty of street parking on Centre in front of Albright. Reverend Nichelle Nelson is the daughter of Tyrone & Carolyn Nelson. A native of Wilmington, Delaware, Reverend Nelson received the call to ministry at age 22 and followed that call like Abraham to “a place God would show her”. She was licensed and ordained to preach the gospel under the leadership of Reverend Dr.William H. Curtis. Reverend Nelson is a graduate of the University of Delaware with a Bachelors of Arts Degree in Psychology. She also possesses a Master of Divinity Degree from Pittsburgh Theological Seminary and a Master of Social Work from the University of Pittsburgh. She currently serves as an Associate Minister at Mount Ararat Baptist Church in Pittsburgh, PA.
Reverend Nelson’s spiritual burden is to bring lost souls to Christ that they might grow in grace and in the knowledge of the Lord such that they know him intimately, serve him faithfully and represent him unashamedly. She is committed to spreading the gospel whenever the opportunity presents itself. Reverend Nelson lives and ministers with the words of Isaiah that “whether we turn to the left or to the right we can hear the voice of God in our ears saying, this is the way, walk in it.” She desires to preach, teach and live the gospel in a way that helps others hear that voice guiding them through this life to life eternal.